Increasingly, governments everywhere are backing away from their earlier micromanagement of international aviation, allowing carriers to tap market opportunities wherever they can be found and with far more ease and responsiveness. Accordingly, the industry will inevitably generate new paradigms of competitive market behaviour. This timely book presents the fresh thinking needed on an appropriate legal and policy architecture to govern the industry in the decades ahead. It continues the pursuit of the topic considered in the author’s earlier work In Search of Open Skies: the contours of a legal regime that should govern international scheduled air passenger (and relatedly, air cargo) transport. A very special feature of the book is its wealth of hard-to-find but vital scholarship and source material, never before collected so conveniently in one place, furnishing a rich and satisfying context that will enable readers to understand better the forces at work during these momentous realignments among carriers, regulators, and markets. Recognizing that the current global air transport regulatory system is inadequate to the commercial demands of the modern industry, the author shows clearly that the imperatives for its reform transcend domestic debates about incremental public intervention in the business of providing air transport. The book’s in-depth analysis of how the law and policy of U.S. and EC airline deregulation can be integrated into the framework for a second-stage U.S./EC air transport agreement builds upon the efforts of government officials, industry stakeholders, and academic commentators who have encouraged a progressive liberalization of air transport. 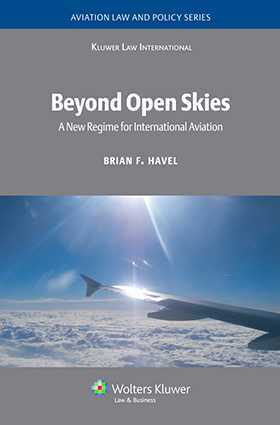 Beyond Open Skies is sure to take its place as the most comprehensive and valuable reference that exists on the complex diplomacy currently defining the future of international aviation. 1. Introduction: Preparing for a New Era in International Aviation. 2. Prelude to Change: A Synthesis of Transatlantic Aviation Relations 1993–2008. 3. Airspace Sovereignty: The Ontology of the Chicago System of International Air Transport Regulation. 4. Model Jurisdiction I: The United States: Airline Deregulation Within and Beyond a Unitary Space. 5. Model Jurisdiction II: The European Union: An Experiment in Multilateral Airline Liberalization. 6. Conclusion: A Proposal for a Second-Stage U.S./EC Air Transport Agreement. Appendix I: Model U.S. Open Skies Agreement. Appendix II: 2007 U.S./EC Air Transport Agreement.